The proposal will return to the council for a final vote after the UW's Board of Regents and some other parties review the plan. The UW’s land-use plan for the next decade and beyond calls for 6 million square feet of new construction to accommodate another 7,000-plus students and employees. The council advanced the proposal with a number of conditions, including requirements that the university set a more aggressive goal for reducing car commutes and that it build hundreds of housing units for its lower-income employees. The vote was 8-0, with Councilmember Teresa Mosqueda absent. Next the UW’s Board of Regents and some other parties will review the plan and share recommendations. Then the proposal will return to the council for final approval. That could happen later this year. The university has been working on its new master plan for years, having nearly reached the growth cap set out in its existing plan, which the city approved in 2003. 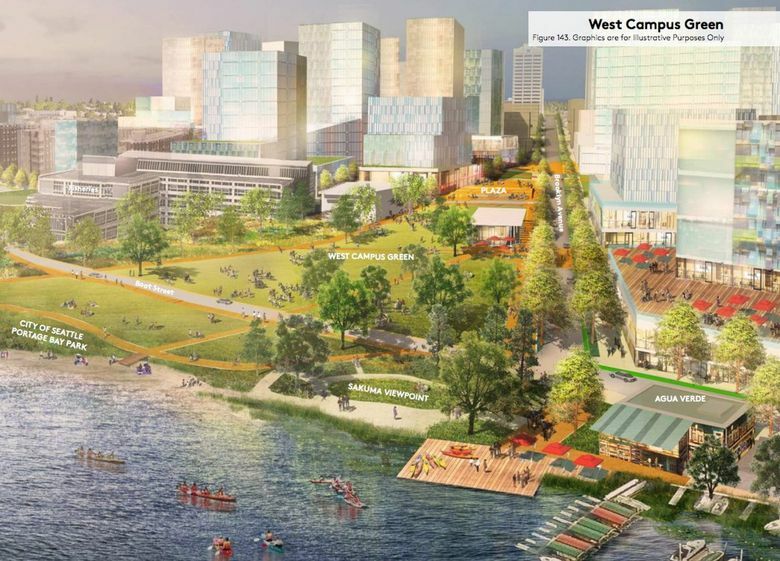 The additional 6 million square feet of academic, athletic, research and office space would include 3 million square feet in an innovation district, where students and researchers would partner with companies, government institutions and nonprofits. That district would be based in high-rises west of 15th Avenue Northeast. The conditions added to the UW’s plan by the council include a requirement that no more than 12 percent of students and employees commute by driving alone by 2028. The university had proposed 15 percent. The conditions also include a requirement that the UW build 450 units of affordable housing for its lower-wage employees. The university had volunteered to build 150. An alliance of neighborhood associations, environmental groups and labor unions has been pushing for the driving and housing requirements.